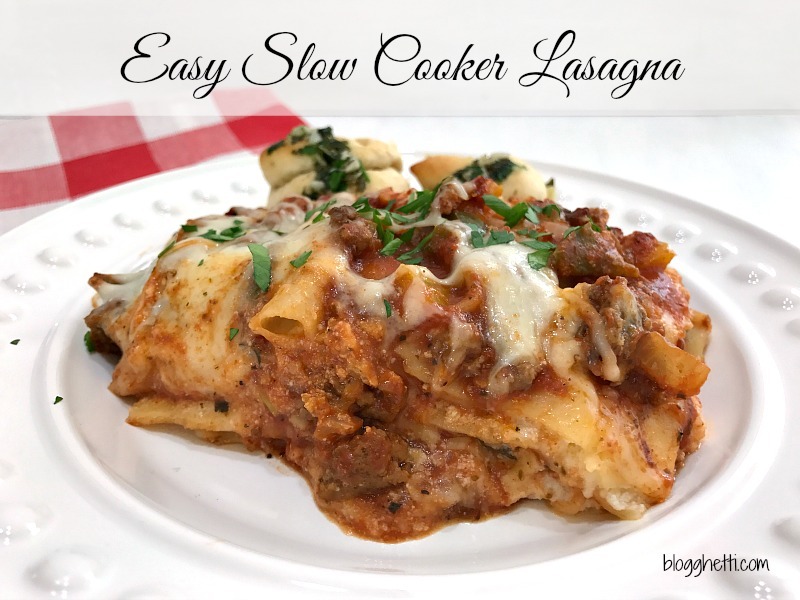 This Slow Cooker Lasagna recipe is super simple and delicious; comfort food at its best. Slow cooked with three cheeses, a homemade sauce that simmers for hours, and you don’t have to cook the noodles first! This slow cooker version is a must-try! Totally gotta love life! I’ve been studying like mad, attending my first Online BlogCon (OBC15), and taking advantage of the cooler weather by kicking back with a book outside, relaxing. No comment on if the book I’m reading is for classes or my own pleasure. I am super thrilled to be attending the OBC15 and learning so much that I think my brain will explode. I am trying to implement what I have learned bit by bit which is why there a lack of new content and newsletters going out. So glad ya’ll are stick around with me though, means the world to me. Because of the craziness here, my crock pot has been overworked and my family is definitely reaping the benefits of that! I make lasagna, at the most, once a year. Seriously. It’s a long process for me since I make the sauce from scratch and do the whole “boil the noodles first” bit. It takes so long to prepare and then an hour in the oven. By the time it’s served and gobbled up I feel like it wasn’t worth it. Okay, it’s worth it but you know what I mean. I have never used the “no boil” noodles before nor have ever made the pasta goodness in the crockpot. It was time to do BOTH! I’m not sure if this was a good idea because now that I know BOTH make the whole process EASY, I may have to make lasagna OFTEN! I totally love this and so did my family. It makes the same as 9 x 13 inch traditional recipe would make so there are definitely leftovers for us for days. I love that because it’s less cooking I have to do and more studying I can do. I also love that I can still make my own sauce and it slow cooks for hours. Try it, you’ll love it! 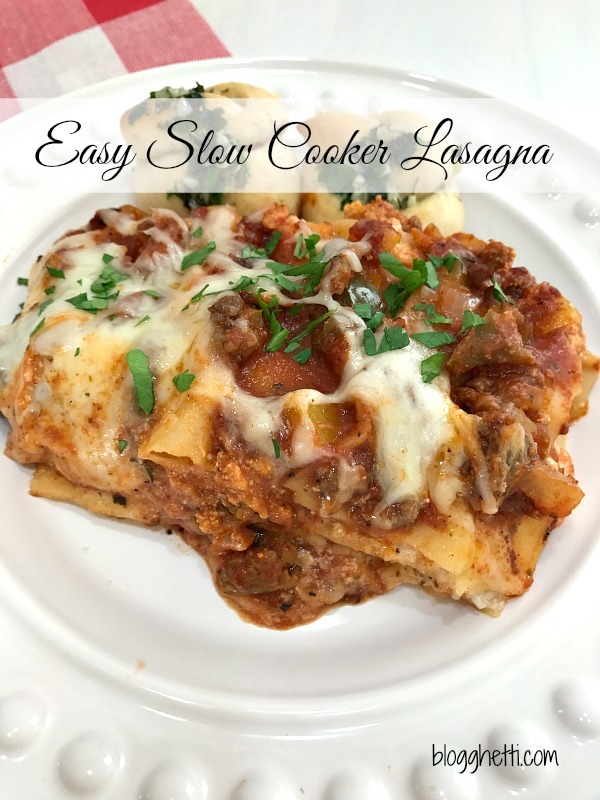 This Slow Cooker Lasagna recipe is super simple and delicious; comfort food at its best. Slow cooked with three cheeses, a homemade sauce that simmers for hours, and you don't have to cook the noodles first! This slow cooker verison is a must-try! In a skillet, cook ground beef until meat is just about cooked through, then add the onion and bell pepper. Continue to cook until the ground beef is completely cooked (no longer pink). Add garlic; cook for 30 - 45 seconds longer. Drain. Stir in the tomato sauce, tomato paste, water, Italian seasoning, and oregano. Add salt and pepper to taste. Combine the Ricotta cheese, 3 cups of the mozzarella cheese and the ½ cup parmesan in a bowl. Spread a fourth of the meat sauce into slow cooker. Arrange a third of the noodles over sauce (break the noodles to fit, if necessary). Spoon a third of the cheese mixture over noodles. Turn off heat and top with remaining one cup of mozzarella cheese and cover for 20 minutes, to allow cheese to melt and lasagna to set some before slicing. It was very moist and even the leftovers weren’t that dry as pasta/sauces can be the next day. Thanks for stopping by and glad to have you with us on HIH!